Unfortunately the information available is extremely sparse in regard to Taino weaving techniques in general. There is only one good source of info that I found in which a team of professional weavers actually analyze one famous Taino woven piece (the cotton cemi), and provide a full, detailed explication of exactly how it was crafted. In any case, this explication does not reveal the use of a loom and strongly suggests that the ancient Tainos knitted or crocheted their fabrics using perhaps one or more knitting needles. 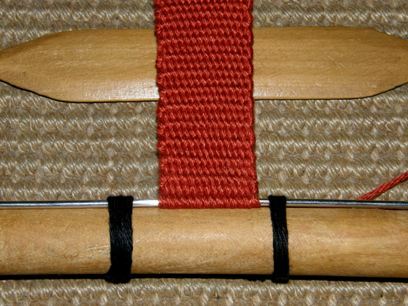 I know that this may be a disappointment to you because you seem to have hoped for info on a loom but right now the evidence seems to suggest that our Taino ancestors and pergaps even their mainland South American Arawakan forebears did not use looms at all, but knitting needles. WOW! Hahom Miguel. I scanned it quickly. I see it did mention sprang as a possibility for part of the construction. I will read it in detail. Very exciting. I read the article in detail. Very interesting. Some areas, for example, around the eye sockets, looks like I could fingerweave that. I am still loking at the wide chest pieces. They certainly look like something that was knitted or crocheted. Looks like I may have to pick up another hobby. Thanks again. Any chance you have an analysis on the beaded cemi? Backstrap weaving, which was done in ancient Mexico produces this which looks exactly like the wider cotton cemi pieces. Hmmm?? Found it. Analysis of one of the beaded cemis article. Thanks for the info on the beaded cemi. I saw the post asking about a Taino loom so I investigated a little and found some promising information. It is part of a bulletin published by U.S. Government Printing Office. It seems to refer to the South American Arawaks. In order to see the complete text, you have to buy it, however.Title is: Handbook of South American Indians, Bulletin Issue 143, Part 5. I am including a link to the page below. If the link doesn't work, try doing a Google search using the title above. If the South American Arawaks used a loom, maybe the Caribbean Tainos also used one, maybe to weave cloth. Hope this helps with your research. Just saw this response. The description is clearly describing backstrap looming (currently done in Mexico, Peru, Guatemala, and am sure in other places in South and Central America). Let me see if your reference is describing South American Arawaks in the past or now.